Middle-grade author Maile Meloy made an important point in the New York Times Sunday Book Review last week. But most of my friends who write for kids don’t have them, and neither did some of the best children’s book writers ever. Theo­dor Geisel — Dr. Seuss — didn’t even like kids. “You have ’em, I’ll amuse ’em,” he’s supposed to have said. Maurice Sendak had none. Neither did Tove Jansson, Tomie dePaola, Ezra Jack Keats or Margaret Wise Brown. The great children’s books editor Ursula Nordstrom said, “I am a former child, and I haven’t forgotten a thing.” It’s not a requirement to have children in order to write for them. You just need to have been one, and to remember what it’s like. That closing sentiment — you just have to have been a kid and remember what it’s like — resonates deeply in my writing life. In some ways, being a CCA has been a benefit in these early days of my writing career. Katy and Sarah inspire stories and stir vivid memories of life when I was their age, but as an aunt I have free time I wouldn’t immediately have as a mother. I have time to experiment and explore the self-publishing industry. I have time to lock myself in a room and selfishly horde hours on end to write. I have time to establish a routine and work out the kinks of independent book production. By the time I become ineligible for the CCA Club, at least I’ll be confident in the process. Then it will just be a matter of finding the time to write. Having Katy and Sarah as a test audience helps boost my confidence as a children’s author, but much of my children’s writing follows a simple concept: I use the same philosophy I use for buying Christmas gifts. When holiday shopping for Sarah and Katy, I ask myself: Would I have loved this gift as a little girl? I shop through my inner child’s eyes. When I spot an item I would have loved, I take a chance on buying it for the girls. So far, it’s been successful. When writing the first Sarah & Katy book, Ruddy is the character who made me laugh and who I loved most to write; he’s been the most popular among young readers. For this book, the Glomtom and the swamplings were my favorite to write; I’m willing to bet they’ll be the next crowd favorite. My inner child giggled throughout those chapters. That’s why Meloy’s point rings so true for me. Having children in our lives is beneficial for children’s authors, but not entirely necessary. I feel more authentic as a CCA in knowing many other (including well-known and much-loved) authors were members of the CCA Club. 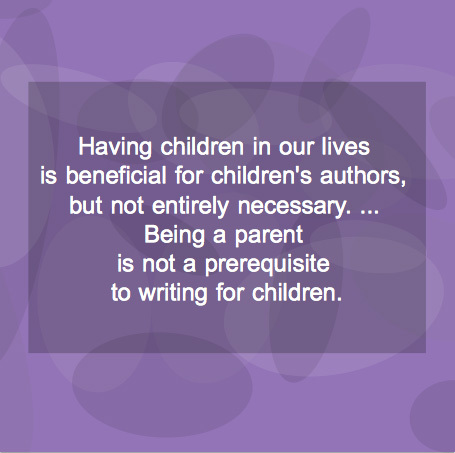 Being a parent is not a prerequisite to writing for children. We just have to be sure not to suppress our inner child. At the keyboard, we suppress our inner adult instead. This entry was posted in Writing and tagged children's author, children's books, indie author, self-publishing, writing, writing tips. Bookmark the permalink. September 2, 2015 at 9:57 p.09.